CHO HANSEUNG TO CHALLENGE FOR KOREAN GS CALTEX CUP: Cho Hanseung 9P (l) defeated An Choyeong 9P in an October 30 playoff match to determine the challenger for Park Yeonghun 9P for the GS Caltex Cup title. Relatively unknown in the West, Cho has not yet won any titles, while An has won a couple, and Park has won the international Fujitsu twice in recent years as well as several Korean titles, as the Caltex Cup, one of the most lucrative Korean titles. Park has held this Cup for the last two years, having taken it from Lee Sedol 9P in 2007. Cho is currently tied with Park for fourth place on the list of Korean pros with the most wins this year; An is in sixth place right behind them. The best-of-five-games title match begins on November 3rd. - Bill Cobb, from reports in Go News, GoGameWorld & Sensei’s Library; photo: Cho playing Gu Li earlier this year in the BC Cup final. CHO HYEYEON TO CHALLENGE RUI NAIWEI FOR WOMEN’S MYEONGIN: Cho Hyeyeon 8P defeated Lee Sula 1P on October 27th to win the right to challenge Rui Naiwei 9P for the Korean Women’s Myeongin (J: Meijin) title. Lee is seventeen and has been a pro for just two years. She defeated Cho by 1.5 points in the semi-finals of the challenger’s tournament, but this event has a losers’ bracket which Cho won, giving her the opportunity for a rematch in the finals. Rui has won this title eight of the ten times it has been contested, including the last five consecutive years. Six of those ten matches were between Cho and Rui, with Cho winning only once, in 2003. Cho also defeated Rui in the Women’s Kuksu title match in 2004; in both wins Cho was still in her teens. 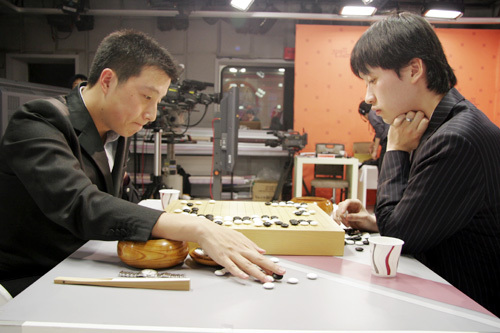 The Myeongin title match is a best-of-three-games contest.